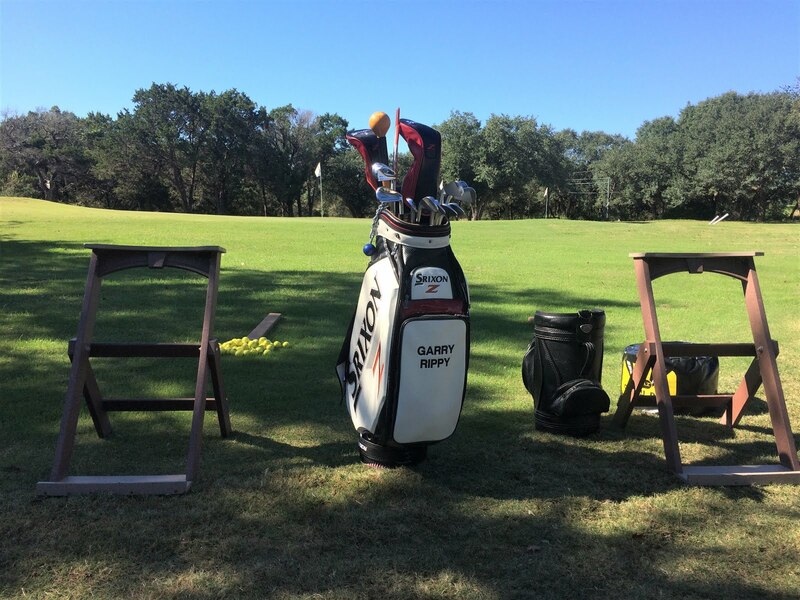 I am always trying to think of creative ways to help golfers better understand the golf swing. Following is an idea or picture which will help you visualize and feel a correct club head path for straighter and more solid golf shots! I am comparing the club head path to that of a plane practicing "touch and go" landings on an aircraft carrier. The plane heads in from the left side of the carrier, lines up with the runway (yellow arrow), makes a brief touch down and then takes off again and circles back to the left to repeat the process. As you can see in my driver downswing, I am coming sightly from the inside or left of the target line before traveling down the "runway" toward the target. As my body rotates, the club follows that rotation and begins to swing left around my body to the finish. Remember there are no straight lines in the golf swing...everything is a circle. The aircraft is following the same principle. The YELLOW arrow indicates the aircraft is coming in from slightly left of the carrier and then is lining up for a successful landing on the runway. If the aircraft followed the LOWER RED arrow, the path would be too much from the left or inside the correct path and the plane would not make it to the runway. In the golf swing, we call this being too "shallow" and will cause you to either top the ball or hit way behind the ball. In addition, this inside path could cause you to hit shots way out to the right, or you would flip the club with your hands and hook the ball. If the aircraft followed the UPPER RED line, that would be too steep of an approach and would not lead to a successful landing. In the golf swing, a path which is too steep and coming from the outside or right of the target line could cause you to hit behind the ball (or deep divots), hit pop ups with your woods, and more than likely hit slices to the right or pulls to the left. This path is commonly referred to as being "over the top". Above is a view of the club starting to swing back to the left of the target line after it leaves the runway. It is the same as the flight path as the plane coming off the deck and beginning to circle around to repeat the process. The bottom line for your golf swing is you want a path which comes slightly from the inside, down the target line and then back to the inside of the target line to the finish. In the picture above I am demonstrating a drill in which I placed a 3' long, 2x4 board about three inches to the left of my golf ball. I placed the ball about 4 inches from the front of the board. My goal is to make small swings and not strike the board. If I come too much from the inside I would strike the board and not the ball (OUCH!). If I come "over the top" I would clip the board on my follow through, again very body jarring! I recommend using an alignment rod in place of the board until you get very proficient at not striking the rod on the downswing. And again, make 1/2 swings to get started. By the way, I really admire and appreciate the skilled and brave pilots who put their life on the line on a daily basis! Terry Dill, retired PGA TOUR and Champions TOUR player (and winner), developed an intricate short game system which covers everything from chipping, pitching, bunker shots and full wedges. I helped him put all of this information into writing after peering through pages and pages of notes he had taken over his professional career. The end result is a very comprehensive short game program in which he was so kind to share with me so that I can now share with my students. 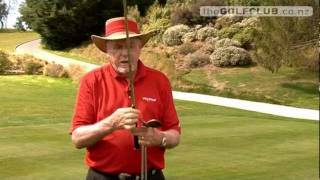 This is a video which briefly explains some of the details of his ideas about the short game. I have incorporated this information into all of the short game improvement programs I offer. Click on "Short Game Programs" on the right side of the page and you will have access to program information including itinerary and cost of each program. A great short game will improve your score and any short game work you put in will help your full swing as well. When faced with a shot from around the green, the lie of the ball will dictate your club and shot selection. 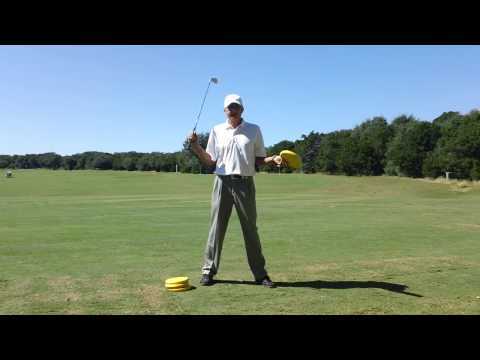 In this video I am demonstrating two shots from the rough about 60' from the pin. On one shot the ball is sitting "up" and on the other the ball is sitting "down". Each of these lies will require a different club selection, but the shot shapes are very similar. In both instances, the ball flight is low. When the ball is sitting up in the rough, a sweep shot is the best selection, but when the ball is sitting down in the rough, the pinch shot is required. There are situations which may call for a flop shot or a higher ball flight and I will review those in the near future. The way to lower scores is to improve your putting! In particular, we all need to become better at making those putts which are 3-5' in length. This is a great drill which will help you make more of these all important putts! Most short putts are missed due to tension...mental and physical. I think the fear of missing the putt is the biggest mental block. This fear causes our hands to tighten on the grip and we end up "wishing" the ball into the hole or "hitting and hoping" the ball goes in. The biggest mistake I see is a stroke which is too long on the backswing and then too short on the follow through. Anytime you "stop" your stroke, you are asking for trouble. Usually the face of the putter closes and you end up pulling the putt. This 3 step drill will help you gain more confidence as you learn to follow through and hold your finish. I recommend hitting 20 putts at each step and work on this drill as much as possible for the next two weeks.